Home Depot is looking to fill 80,000 plus seasonal positions this spring. Home Depot is making its yearly hiring push, aiming to fill more than 80,000 jobs for its busiest season. That's 10,000 more jobs than the home improvement retail chain posted last year at this time, marking a 14% year-over-year increase. In a statement, the company's executive vice president of human resources, Tim Crow, said, "We find some of our best associates during our peak season, and many of them have built long, meaningful careers with us." 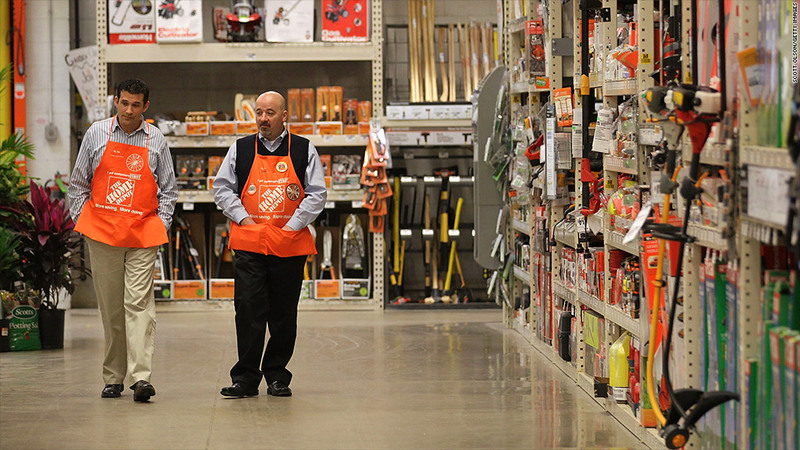 Spring is typically the strongest time of the year for Home Depot (HD), and the move shows the company is preparing for a better season than years past. After all, the housing market is showing positive signs. New home sales and existing home sales are up, and home building remains robust. The Atlanta-based chain is particularly sensitive to the fluctuations of the nation's housing market. It cut 7,000 jobs and shut down several brands at the tail-end of the recession in 2009. Since then, Home Depot has increased its spring hiring push every year, adding 60,000 seasonal associates in early 2011 and 70,000 in 2012. The chain employs upwards of 300,000 workers in 2,256 stores across North America. Prospective employees can apply online, and military veterans can now use a recently launched skills translator tool designed specifically for them.